If you caught my recent MAC cosmetics car boot booty post, you will probably already know that I've really been enjoying picking up various items from car boot sales recently. I've managed to collect quite an assortment of goodies, including a fair few bargain make up and beauty products, from these early Sunday morning outings. 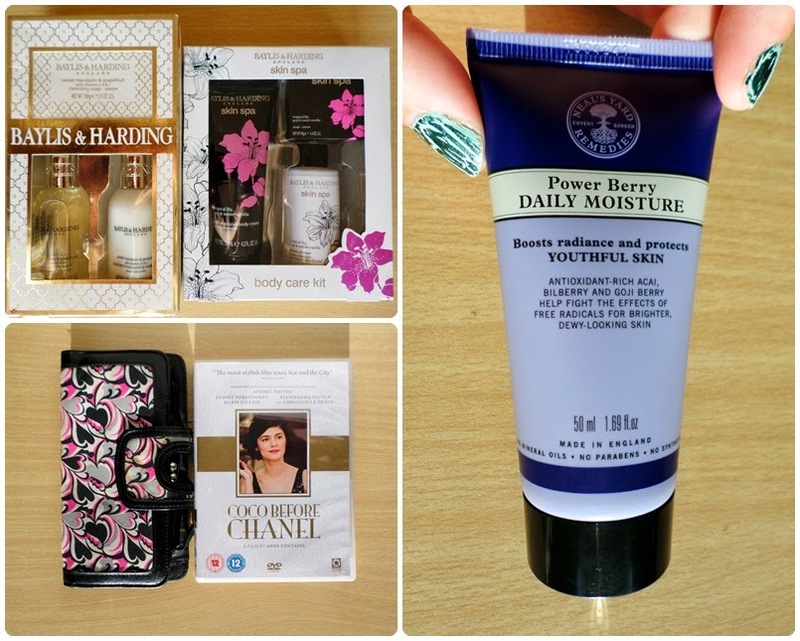 This week was no exception as I picked up some lovely items including two brand-new Baylis and Harding gift sets and a Neal's Yard facial moisturiser. The Baylis and Harding gift sets are something most of us are familiar with as they are available to buy by the truckload around Christmas time! The sweet Mandarin and grapefruit gift set is actually still available from Debenhams and is priced at £5. The Tropical Lily, Goji and Sweet Vanilla gift set is one that I can't see currently being sold anywhere but it looks like a really nice set and is a slightly unusual fragrance that I'm sure to enjoy using. I would guess that this set would also retail for around £5. Both of these gift sets only cost a mere 50p and they were purchased from two different sellers! This item is something that I'm quite excited about as I've never tried anything at all from Neal's Yard before. This facial moisturiser is brand-new and sealed and currently retails on the Neal's Yard website for a whopping £12 whereas I purchased this for a mere 50p. This looks to contain some very good ingredients and I'm really looking forward to trying it. You can expect to see a full review soon! I thought I would also include a couple of other items that I picked up at the car boot sale. The first one is this lovely purse which I really like as it's quite big and has several compartments inside for organising all of my money, cards and receipts. This was only 20p! The last item is a DVD of a film I've never seen before which looks quite interesting and I seem to remember it being quite well reviewed when it came out. This was only 20p once again. What do you think of my car boot booty this week? Have you picked up any super duper bargains recently and if so, what were they and where did you find them?